Yawn! I have been awake for the World Cup and it was amazing with Italy winning on penalties. No Italian pasta today even though I am sure I have a plain tomato and basil one in my archive but since the morning beckons, I prefer an ice blended coffee a.k.a Hai Peng's Special Coffee Breeze (RM6.50) to keep awake with! It's not mine but from Splashie Boy's recent trip to Terengganu. Whenever one goes around that area - three essential stops along the coastal road from Kuantan to Terengganu are the keropok lekor stalls dotting the side of the road, Kemaman or Chukai for seafood (stuffed crab) and coffee at Hai Peng. 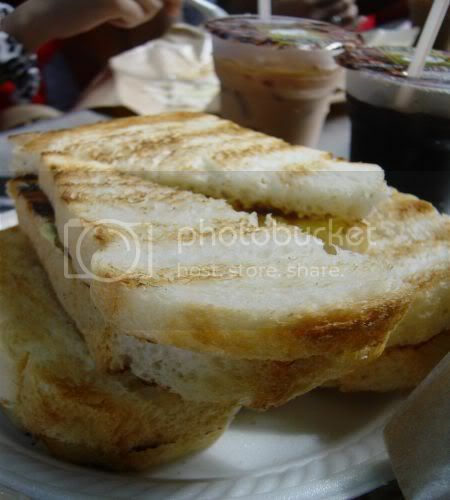 They are famous for their traditional coffee and of course breakfast items. Breakfast was a feast - everyone was tucking into Nasi Lemak, toasted bread with kaya (RM0.90) and half boiled eggs. Their iced coffee comes in chilled plastic cups that are sealed on top. This place has been around for ages i.e. before World War Two and is very much an institution in Kemaman. Other specialities are their Nasi Dagang and the charcoal toasted bun filled with kaya and ice cold slabs of butter. Splashie Boy took a picture of the ketupat daun palas as it was served differently from here. 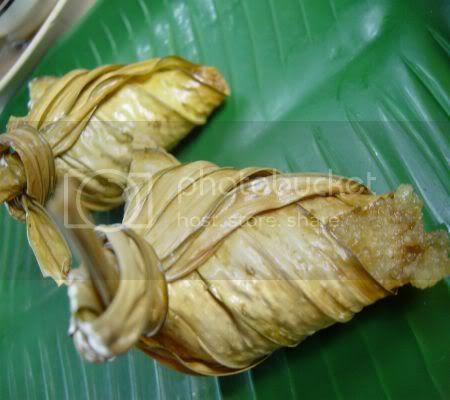 They had pan fried it hence the ketupat was slightly crunchy on the outside. Sorry for the short write up but I wasn't there to taste the great food! No pictures of the seafood they ate at night as someone forgot to snap any. Check the other reviews as they have lots of pictures of seafood they ordered including the famous stuffed crabs. When I was a kid, my mom would make me half boiled egg for breakfast. I would add soy sauce, white pepper and dip it with toast or crackers. It came with Milo too. My dad took me to Kemaman for fishing many years ago. I wonder if the town has changed. I also remembered driving through Karak. We would fish for Snakehead (Sang Yue) and Toman. Oh my goodness. I need one of those iced coffees right away! an9ie - never mind! Kaya is comfort food as it's so yummy. I now toast the soft buns myself on a pan, put kaya and a slab of cold butter - it's heavenly. fatboybakes - I also want some but sadly I could not go on this trip. lisa - When I was typing that early in the morning I was yawning so hard and that coffee was the only thing perking me up a bit. 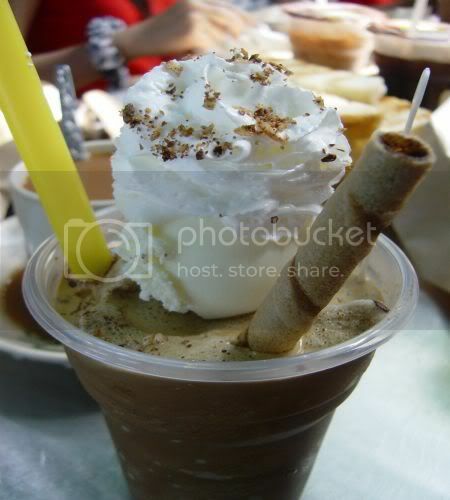 Its still pretty good ... but only the COFFEE and FRIED MEEHOON I reckon! It's a pre-requisite to stop here on the way back home to KL after a Pulau Redang dive trip! This coffee shouldn't be missed when you have the chance to pass by Chukai, Terenggan.